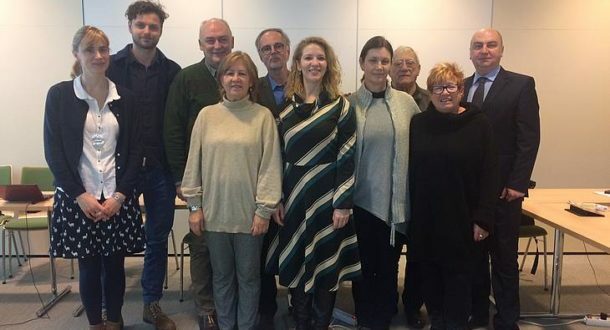 The first meeting of the EU project “Building Social Dialogue in a Changing Labour Market: Peer-learning and Capacity building for Central and Eastern European Workers’ Organisations Representing Performers” took place in Ljubljana, on the 28th and 29th of January 2019. This two-year EU project, that follows the creation in 2016 of a EuroFIA group of unions in Central and Eastern Europe (CEE), aims to allow tailored capacity building of performers’ unions in CEE countries through study visits and thematic exchanges. Those unions even though they vary in their size and experience, share many challenges as well as a common history. The group was willing to engage in a project to undertake a series of 5 study visits to sister unions from across the EU in order to draw on successful strategies and approaches in other countries. Overall, the project aims to help these unions develop their national work and strategy. This first meeting brought together the representatives from the group of participating unions from Hungary, Poland, Croatia, Slovenia, Romania and Latvia to share their SWOT analysis of their national situations and in this way further refine the priorities for the study visits. The discussions were constructive and priorities areas have been identified. The group will first visit DSF, in Copenhagen, on the 27th and 28th of June 2019. A final seminar will be organised end of 2020 to reflect on the outcomes of the study visits and to provide additional training and expert input in areas identified as being of key strategic importance. It will also be the occasion for the participating unions to exchange views on their national strategic plans. FIA secretariat will produce a short handbook gathering the key findings and good practice in relation to the key, baseline priorities of union organising, developing social dialogue, and strengthening collective bargaining.